P & D Barn Floor Grooving has been grooving Americas Dairies for the past 20 plus years and millions of square feet! Coming Soon - We will be offering Mini-Grooving! Our business continues to grow through referrals from our customers. We sincerely "THANK YOU" for recommending us. "Grooving Doesn't Cost ... It Pays!" See Doug grooving a floor and the process of how Barn Floor Grooving is done. Accepting all Credit Cards with No Fees! No upfront costs, no minimum requirements for the size of your project, and the BEST rates for making your operation "split-proof" and safe. Concrete Floor Grooving Helps Prevent Loss. One of the BIGGEST problem farmers face is losing cows that injure themselves doing the splits on slippery concrete! 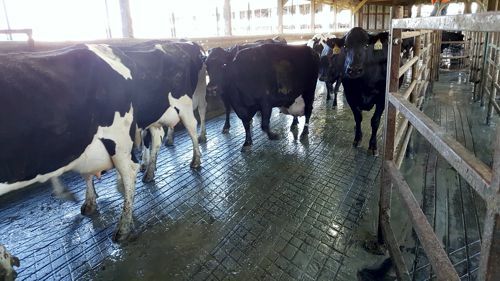 Here is a great article on Concrete flooring for dairy cows. When new cement is poured, most cement floor contractors will have grooves “floated” in the cement. The problem is that the grooves are rounded and they only go only in 1 direction. Years of scraping and cleaning barn floor concrete can cause the floor to get polished and slick. Another reason to groove concrete barn floors is that a cow can lose their footing while being “ridden” by another cow (through heat detection). Single cutting grooves in the cement provide minimal help ONLY if the cow slips in ONE DIRECTION! Double cutting with our unique diamond pattern and mini grooves provides maximum protection by preventing hoof slippage in ALL DIRECTIONS! 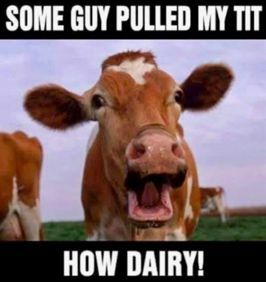 When a farmer loses a cow to a “splits” injury, they risk losing not only the animal itself, but also a lot of potential revenue from milk production and the loss of good breeding stock. 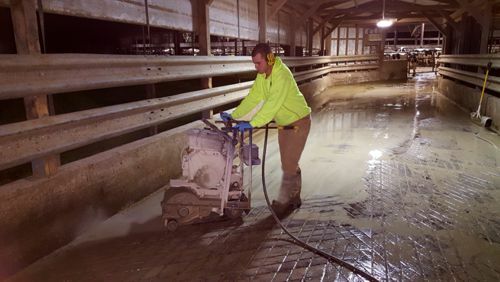 Whether working on a freshly poured floor or one with existing grooves, I “groove” at an angle over the floated grooves, using my diamonds blades to give the original grooves a sharp 90 degree edge that helps protect the cows by enabling them to easily move in any direction, while allowing the farmer to scrape the floor clean without hitting the grooves. Page Summary: P and D Barn Floor Grooving offers mini groove flooring, concrete grooves, scabbling, concrete services, barn floor grooving, cattle flooring, concrete grooving, concrete companys, dairy flooring, concrete resurfacing and other safety grooving for stall and dairy cattle flooring in Wisconsin, Minnesota, Iowa, Illinois, Ohio, Pennsylvania, New York, Michigan, South Dakota, Idaho, Tennessee, North Carolina and California.